Get your Giving Guides ready! Minnesota's 24-hour online give-a-thon, Give to the Max Day, is almost here. At Charities Review Council, we know you're seriously invested in the causes you care about, and that every dollar matters to the nonprofits you generously support. That's why we work alongside donors (and nonprofits) every day, ensuring donors like you can feel confident when making a giving decision. Give to the Max Day is no different! We're here to help you prepare for this year's giving holiday with two easy-to-use tips and a guide for nonprofit outreach. It doesn't get any better than that! But first, let's talk Give to the Max Day; What is it? How can you participate? And more importantly, WHY should you participate? We've got answers to those questions and more below. If you're new in town, or just haven't heard of Give to the Max Day, you're in the right spot! Give to the Max Day is Minnesota's 24-hour online give-a-thon, where generous donors (like you!) celebrate giving by supporting the causes they care about most. Last year more than 62,000 donors logged on to GiveMN.Org to give more than 18 million dollars. That's huge! Besides the "feel good" benefits, making a gift on Give to the Max Day has some added benefits, like Golden Tickets! Every hour, GiveMN will be awarding one Golden Ticket of $1,000 through a random drawing of all donations transacted during the previous hour. Additionally, two Super-Sized Golden Tickets of $10,000 each, will be awarded as well. That means your $10 donation could transform into a $10,000 donation for your favorite nonprofit (or school). So go ahead, grab your lucky socks and make a gift to your favorite Minnesota nonprofit for a chance to turn your $10 (or more!) into $10,000! Give to the Max Day makes giving easy and fun. Click here to get started! 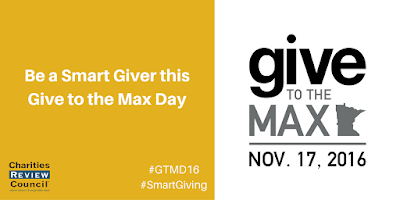 Mark your calendars; Give to the Max Day is Thursday, November 17th. Too excited to wait? Don't worry, you can schedule your online gifts as early as November 1st, and still have it count towards the Golden Ticket prizes outlined above. Be a smart giver and use our giving tips (outlined below) and nonprofit outreach guide, found here. TIP #1 Use our list of strong, trustworthy, and accountable nonprofits. Take some of the guess work out of choosing a nonprofit to support. 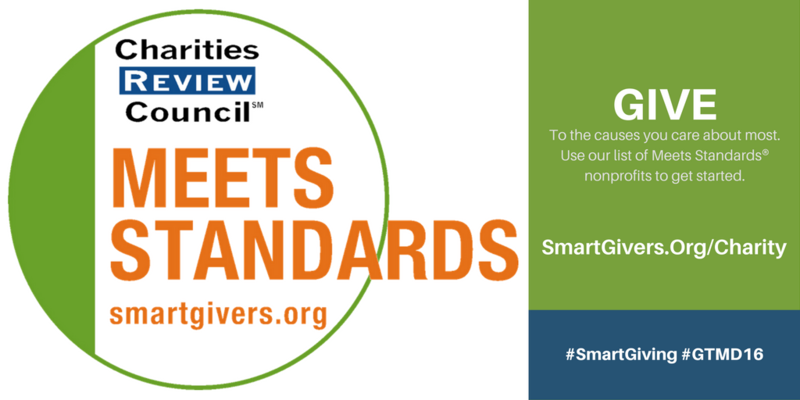 Nonprofits included on our list have taken steps to align their internal policies and procedures to widely accepted standards for nonprofit accountability and strength. These are nonprofits that you can feel confident investing in. TIP #2 Know what questions to ask of a new nonprofit partner. It's okay to reach out to ask additional questions. Our nonprofit partner organizations will welcome a donor phone call. And, relationships with the organizations you're planning to support matter almost as much as the dollars donated do. So, feel free to make a quick call, or send an email to an organization of interest, asking clarifying questions. To make it easy, we've prepped a conversation starter (below) and an outreach guide (found here!) for you to use when reaching out to nonprofits you're considering supporting. "Hi! My name is____, and I'm interested in supporting your organization on Give to the Max Day, and in the future. Would you, your program director, or your executive director have a few minutes to answer a couple of questions? For the full nonprofit outreach guide, click here! The nonprofit outreach guide includes sample questions, the importance of each question, and interesting follow-up questions to ask of a new nonprofit partner. From all of us at Charities Review Council, we hope you have a generous and prosperous end to your year, and a fabulous Give to the Max Day. Give on!